I am so excited to give this coat its own blog post today because it is such a great one! It is very nice quality and comes in 7 cute colors, which makes it really hard to decide which one to order. The price point is also reasonable compared to other similar coats! To make it even more affordable, it is on major sale today!!!! And free shipping! The J. 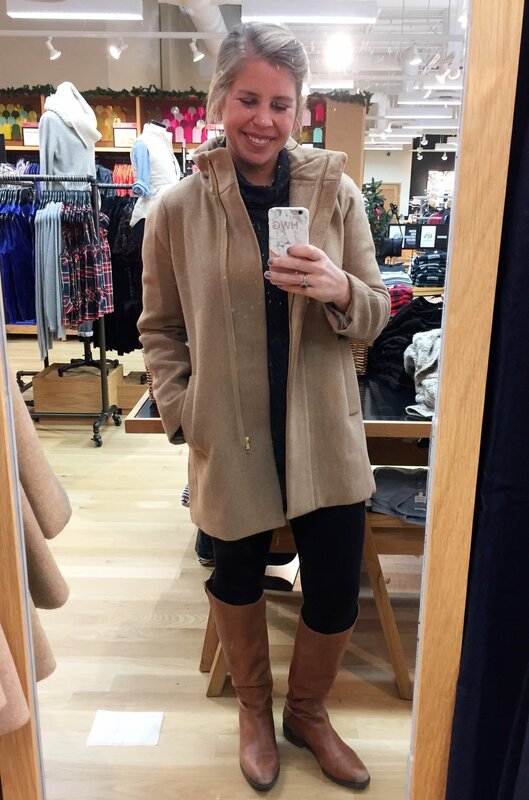 Crew Factory coat that I am talking about today is almost identical to this J.Crew coat (pictured below) that is much pricier. The main difference is the pockets. And the enormous price difference. Aside from that, they are basically the same coat. And this one is also super similar. When I posted the picture of me in the green coat on Instagram, I got some questions about sizing because the reviews say it runs big. I totally agree with that review. However, I typically like my coats pretty big, so I can comfortably wear sweaters underneath them. I am usually between 2 sizes, and I went with the smaller size, and there is still plenty of room to fit layers underneath it. So if you are between 2 sizes, I would choose the smaller one. Parker and I actually got the green one I am wearing for my mom's birthday gift. However, I knew I wanted to get one for myself too. I went to the store last week and tried on every color they had to decide which one I like best on me. Before I tell you which one I chose for myself, I'm going to show you the pictures and see if you can guess which color is my favorite! Also, please ignore the dirty mirror that is causing spots to appear in funny places. I am wearing this super soft plush turtleneck tunic, these leggings, and these boots in all the pictures below. Did you guess that pink is my favorite?! I have always loved bright colors, but I have been loving bright pink even more than usual lately. So PINK is the color of the coat I like best for myself! My mom likes the green one best. Which color is your favorite?